Hardy Herdwick sheep dry out quicker after a rainstorm than white-wooled breeds. 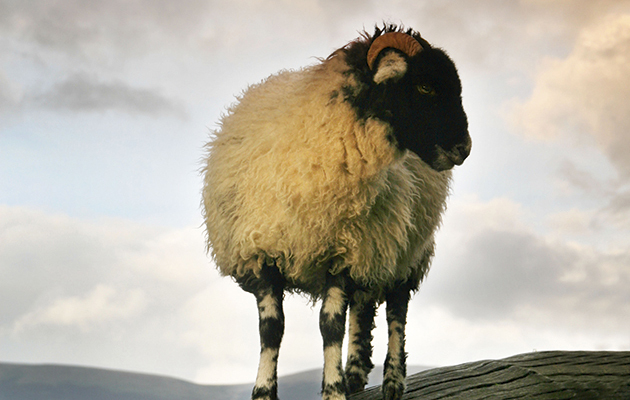 Sheep breeds are of an astonishing variety throughout the British Isles. Johnny Scott unravels the history of sheep farming in Britain, to discover how such an incredible variety of sheep breeds graze our hills today. Have you ever felt the urge to drive sheep across London Bridge? It’s one of the weird and wonderful privileges afforded the freemen of the city of London. Last season, I overheard our MFH say to a keen young member of the field, famous for her long legs, blue eyes and innocent smile, “Now, my dear, you cut along to the far end of this lane and go on point for me at the corner of the wood opposite a field of peculiar-looking black sheep.” These I later identified as dark-skinned Zwartbles, big sheep from the cold, wet marshes of northern Holland and yet another Continental breed gaining popularity for hardiness, mothering instinct, tight fleece and resistance to foot-rot. I sympathised with our MFH in not knowing what they were as there are currently around 35 million sheep of various ages in Britain, including 16 million ewes, made up from more than 60 different breeds and every conceivable permutation of crossbred or mule, which now makes up the basis of all commercial lowland sheep systems. The Blackface is horned in both sexes. Despite the enormous diversity of landscape, climate, soil and herbage, the British Isles have always been ideally suited to sheep farming. The Celts were exporting raw wool and cloth to Rome, “so fine it was comparable with a spider’s web”, before the Roman invasion of 55BC. The Romans introduced long-wool breeds from Spain to improve the small, horned, native sheep, establishing a large wool-processing factory at Winchester early in the Occupation and, by AD100, England and Spain were recognised as the twin centres of wool production in the Western world. The sheep industry collapsed in the chaos following the fall of Rome but, by the eighth century, the Saxons were again exporting wool and the importance of sheep breeds is reflected in place names such as Shepley, Shipley, Sheppey, Shipton, Shipbrook, Ramsdean and Ewesleys. In Saxon Britain, milk for cheese, an important source of winter protein, was the main product of sheep, with wool and manure being valuable by-products. Sheep breeds are the most numerous of livestock listed in the Domesday Book. Cheviots, white-faced hill sheep from the Scottish borders. The Normans, and Cistercian monks in particular, created an industry with sheep breeds that became the backbone of the nation’s might and prosperity, symbolised by the Woolsack in the House of Lords. The object of the Cistercian Order was simplicity and self-sufficiency, but a surplus of wool from its farming operations coupled with a huge demand from Continental wool merchants and a desire to build beautiful religious houses, soon led to commercial sheep farming on a massive scale. Vast flocks were established across the uplands of Britain. In Yorkshire alone, sheep belonging to abbeys such as Fountains, Kirkstall, Roche, Byland and Rievaulx are thought to have numbered 250,000, with probably as many at Cistercian abbeys in the Scottish Borders. Other monastic establishments and many landowners were quick to follow, as Britain’s sheep breeds gained a reputation among Flemish and Italian merchants for growing the finest wool. By the early 14th century, sheep numbers had reached upwards of 20 million. Raw wool was exported to Bruges, the centre of the weaving industry, and reimported as cloth. However, in 1370, Edward III doubled the value of wool by encouraging Flemish weavers to settle in England, transforming the nascent domestic cloth industry and creating a lucrative export market in woven goods. Many weavers settled in Norfolk and Suffolk, with others moving to the Westcountry, Cotswolds, Yorkshire Dales and Cumberland. 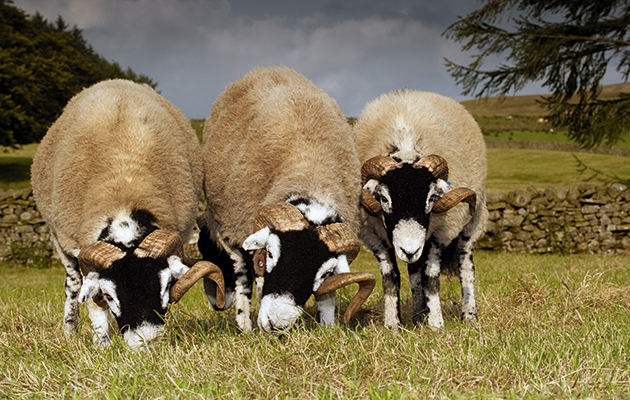 Swaledale rams, usually found in the Yorkshire Dales, County Durham and around the pennine fells of Cumbria. St Mary’s in Bury St Edmunds, St Agnes’s in Cawston, All Saints’ in Stamford and St John the Baptist’s in Burford and Cirencester. 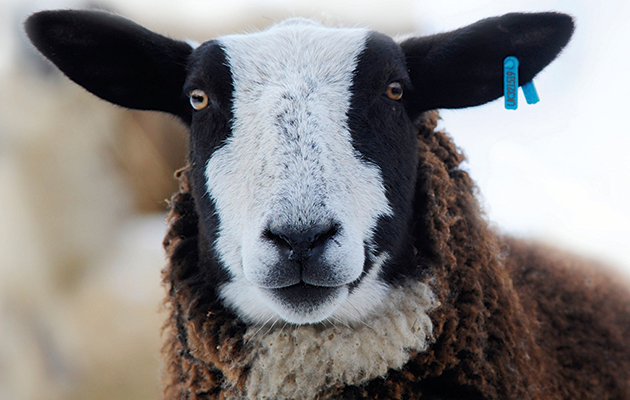 From the 12th to the 18th centuries, the prime object of sheep farming was wool production. Milk for cheese and manure for maintaining soil fertility were subsidiary, meat or carcass conformation being almost ignored. When a sheep was too old to produce wool, it was merely fattened for slaughter. Sheep breeds, in the modern sense, did not exist, with sheep classified by the type of wool produced in different parts of the country, which in turn was dictated by regional and nutritional variations in grazing. Broadly speaking, there were small, horned, white, tan or black-faced coarse-wool sheep on poor ground throughout the Westcountry, Wales, the north-west, coastal East Anglia, the Borders and parts of Scotland. A larger, polled, long-wool type was found across the better land in Kent, the Midlands, the Cotswolds, Lincolnshire and into Yorkshire, and a dense-fleeced, short-wool type on the downland pastures of the south coast and along the Welsh border counties. This was the most sought-after wool and the best came from the Benedictine monastery at Leominster, the famous Lemster Ore, the golden fleece of England, “that with the silkworm’s thread, the finest doth compare”. 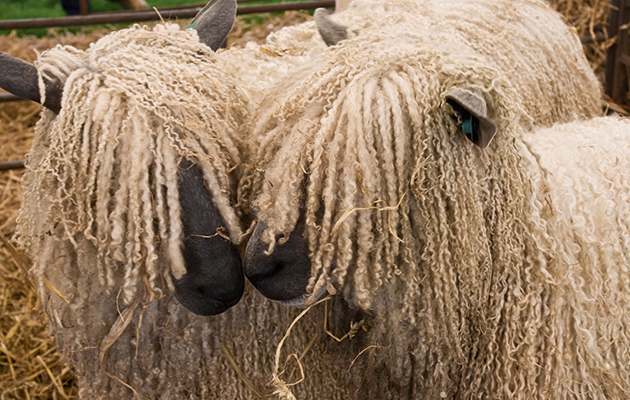 Although medieval sheep farmers relied on agricultural improvements and superior grazing to enhance wool quality, both long- and dense-wool sheep breeds had their origins in the Roman sheep that survived on the Kent marshes. These became the property of the Benedictine Order after it was established at Canterbury in AD597 and “Canterbury” sheep would have been taken to newer Benedictine houses as they were founded. The 18th century was a period of rapid change for every section of society but none more so than farmers facing the challenges of demand created by a rising population, increasing colonisation, a large standing army and a burgeoning distilling industry. Virtually every farmer was caught up in the fever for improvement in crops and livestock fuelled by escalating food prices. Landlords led the way, with nobles such as Townshend, Egremont, Leicester and Bedford in England, and Graham, Grant, Hamilton and Tweeddale in Scotland transforming their estates through drainage and fertilisation. Robert Bakewell of Dishley in Leicestershire and John Ellman of Glynde in Sussex were two of the agriculturalists from that period to have the greatest influence on British sheep breeds. 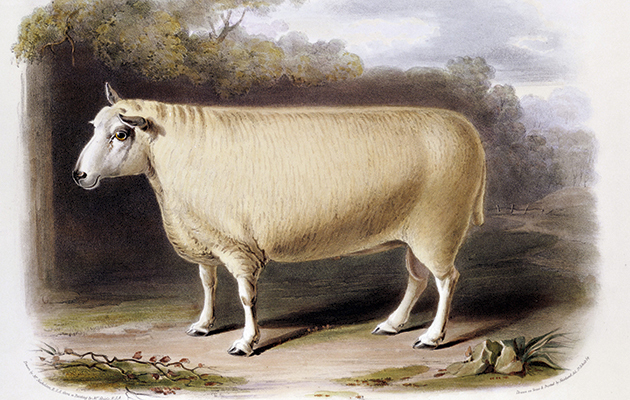 Carcass conformation was now as important as wool and Bakewell, the foremost exponent of selective breeding, developed the Leicester, a large, long-wooled, fast-maturing sheep. At the same time, John Ellman was transforming the lean, leggy sheep of the South Downs into a squat, compact one that gave excellent mutton yield – mutton being meat from sheep more than two years of age and preferably older – while retaining a good, dense fleece. The new communication system of roads and canals made quality livestock available to farmers across the country and Bakewell’s Leicester improved the old Cotswold and became the progenitor of long-wool sheep breeds such as the Devon and Cornwall, Teeswater, Wensleydale, Border Leicester, Lincoln and Whitefaced Dartmoor, while Southdown rams were used on downland breeds to create the Dorset and Dorset Horn, Hampshire, Wiltshire Horn, Oxford Down, Ryeland, Shropshire and the Suffolk. The latter would become the most famous fat-lamb-producing sire in the world. 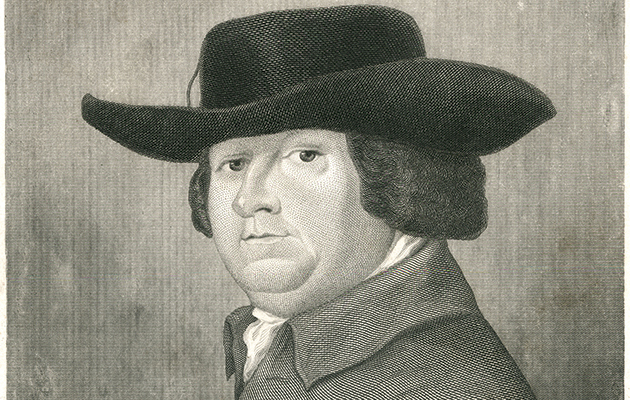 Robert Bakewell was one of the most important figures in the British Agricultural Revolution. To accommodate agricultural expansion, Enclosure Acts had been passed in 1760 and continued almost annually for the following century, as more than three million hectares of common land was enclosed. For the first time since the dissolution of the monasteries, sheep in large numbers were established on the hills of northern Britain, with graziers burning old heather to create palatable regrowth, which ultimately led to the development of grouse moors. It would not have been possible to fence the hills, so early graziers, appreciating the delicate nature of the herbage and its susceptibility to overgrazing, devised a method of “hefting” the sheep. Each area of hill was assessed for its potential stocking rate and a sustainable number of ewes was established on individual areas of land known as hefts. It was labour-intensive but, by utilising the territorial nature of hill sheep and replacing old ewes with ewe lambs from the same heft each year, knowledge of grazing territories passed from mother to daughter. The sheep of hefted hill flocks today are the lineal descendants of those sheep breeds established 300 years ago and graze exactly the same ground. Robert Bakewell created the New Leicester (Dishley) breed by selective breeding. By the 1840s and for the following hundred years, it was possible to travel the length of Britain and recognise each county by the characteristics of its sheep breeds: the big Romneys of Kent; close-wools of the Home Counties and Welsh borders; long-wools of the Midlands and north; and horned, coarse-wool hill sheep of Exmoor, Lancashire, Yorkshire and Cumberland – Lonk, Dales-bred, Rough Fell and Swaledale. The grey Herdwick thrived in the Lake District and hardy Blackface sheep throughout the heather uplands and Highlands of Scotland. Wales and the Scottish Borders had polled hill sheep: Hill Radnor, White, Black and Balwen Welsh Mountain, Clun Forest, Beulah, Badger Face and Cheviot. Farther north was the North Country Cheviot of Sutherland and Caithness. Wool was still a major part of farm income; even on poor hill farms the wool clip was said to pay the rent of a farm or a shepherd’s wage, but mutton was of equal importance. The sheep industry altered dramatically after the Second World War, as man-made fibres replaced wool and eating habits changed. Smaller cuts of lamb became the housewife’s choice. The emphasis now was on lamb production, with standardisation dictated by supermarkets requiring a lean lamb ready for slaughter at 16 weeks. The perfect ewe to meet these requirements was a crossbred. Ewes drafted from hill flocks as part of the hefting practice – Swaledale, Welsh Mountain or Scotch Blackface, for example – are crossed with a Bluefaced Leicester ram, combining the hardiness and mothering instinct of a hill ewe with the size, prolificacy and milkiness of the long-wool. 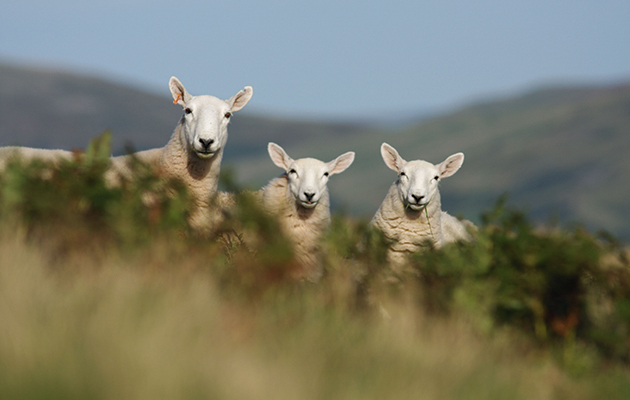 Their progeny, known as North Country, Welsh or Scottish mules, are put to an outstanding carcass-quality terminal sire such as a Suffolk or Texel, to produce the perfect lamb for today’s market. Our hill sheep are the same as they were 250 years ago, and many small flocks of regional sheep breeds still exist, but the half-bred predominates and farmers endlessly experiment to find a ewe that suits their farming system. Thus we also have Romney, Cheviot, Dorset, Clun and Beulah mules, to name but a few. There is even a Zwartbles mule. Now that is a peculiar-looking sheep.